First revealed on Twitter by Joe, this new signature model looks very classy indeed. 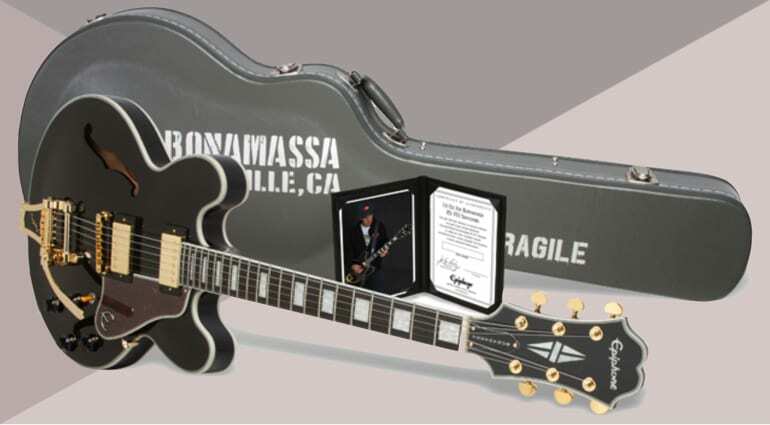 That Epiphone Joe Bonamassa limited edition ES-355 I wrote about earlier this year is about to be released. Now we’re being treated to the official demo video for this guitar. First revealed on Twitter by Joe, this new signature model looks very classy indeed. 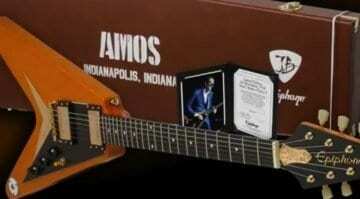 This new limited edition run is based on one of Mr Bonamassas’ own ES-355 hollow body archtop guitars. The new Epiphone Joe Bonamassa 355 has a three-ply maple/poplar/maple laminate top and body. The guitar comes in an Ebony finish that is finished off with a nice white and black binding. The mahogany neck is bound and has a SlimTaper-D profile with an ebony fingerboard with a GraphTech Nubone nut to aid tuning stability. Aesthetically, I think it looks pretty classy in this tuxedo-style finish. 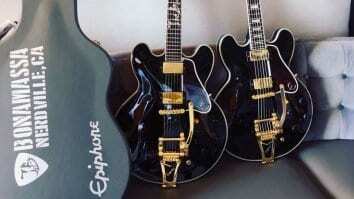 I still find it funny that Epiphone guitars can get away with using ebony for fretboards, yet $5k plus Gibson signature models are using Richlite. What is that all about? The guitars have a Bigsby B7 vibrato tailpiece with a Vibramate String Spoiler (I have one of these on my Yamaha TVL and they are great) to ease string changes, plus an ABR-1 LockTone Tune-O-Matic bridge and Grover Rotomatic tuners. 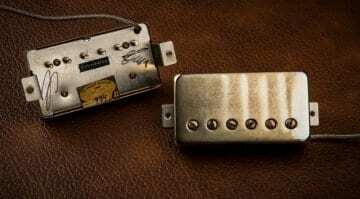 The guitars come loaded with a pair of Alnico II ProBucker humbuckers, with a ProBucker 2 in the neck and slightly overwound ProBucker 3 in the bridge position. 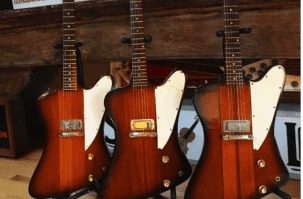 This appears to be Joe’s pickup of choice with his Epiphone models, as he also used them for his recent Epiphone Amos Flying V signature model. We don’t yet have an official rrp, but it is now on the Epiphone website at last. It’s a looker and has some attractive hardware included, like that Vibramate, which I have found makes re-stringing a Bigsby trem so much easier. A nice touch. $999 street over here in the States. The “Richlite” thing? IMO it’s that Gibson is stuck with a crapload of Richlite fingerboards that Henry bought that they’re trying to get rid of while the Chinese just keep buying ebony (which the Chinese must be buying cheap and readily as they’re sticking it on sub $300 guitars).